As a punishment for trespassing, Kirk and friends are forced to relive a violent moment from Kirk's ancestry: the shootout at O.K. Corral. So the Enterprise is putzing around in space when they come across a strange psychedelic satellite that warns them not to continue on and, in fact, to turn back... OR ELSE. Not one to take orders from strange satellites, Kirk assures the disembodied voice that the Enterprise is on a peaceful mission to establish friendly relations with new races, a descriptor that happens to apply to this guy. They hail, but get no answer, so in a desperate attempt to fulfill their orders of establishing contact with the Melkotians, Kirk, Spock, Bones, Scotty and Chekov beam down to the planet. And materialize in a dense fog. Before them, the demonic glowing eyes of a Melkotian. The xenophobic Melkotian treats them like a disease. He informs them that because of their trespassing, they will be punished by death. And the manner in which they die will be taken from Kirk's mind, since he's the commanding officer. So how does it go down? The landing party is suddenly surrounded by an old western town. Accurate, but incomplete. 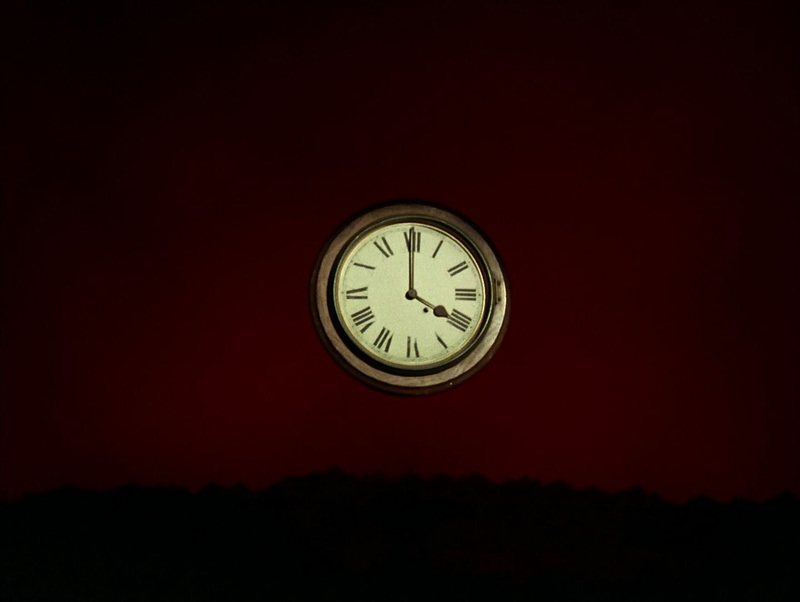 The buildings show only the front facades, the sky, which is obviously more of a wall, is blood red and there's a random clock hanging in the air. They soon discover they have been taken to an approximation of Tombstone, Arizona, the setting for the shootout at the O.K. Corral. Meh. Could be worse. Could be Moscow. Doesn't take long for some non-player characters to show up. The townfolk recognize the landing party (even with their uniforms and pointed ears) as the Clantons, who happen to be the losing party in the Clanton/Earp feud. When they stop by the local tavern, a young woman by the name of Sylvia jumps all over Big Pimpin' Chekov, whom she knows as William Claiborne. Not one to argue with a beautiful woman on his lap, Chekov accepts this and cavorts with the young woman. Unfortunately, it attracts the attention of Morgan Earp who wants Sylvia for himself. 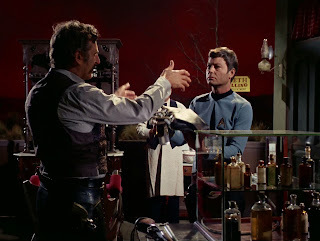 They narrowly avoid a gunfight before Kirk attempts to convince the bartender of his true identity, to no avail. They're being constantly warned to leave town or else get into the famous gun fight, but when they actually try this, they find a forcefield surrounding the small town. Their peaceful options now limited, their only hope is to knock out the Earps with an airborne tranquilizer. In order to get the needed chemicals for the tranquilizer, Bones finds the dentist's office. And the dentist just happens to be "Doc" Holiday, part of the Earp clan. Doc agitates Bones a bit, but allows him to take the chemicals he needs. Take it! I don't need this junk anyway. Meanwhile Chekov has actually fallen in love with Sylvia, a woman he met not a couple hours ago in a fantasy land created by aliens. Sylvia tries to make plans to get married to Chekov. Chekov understands this can't happen because he has to leave on the Enterprise, but he doesn't understand that it can't happen because she isn't frakkin' real. Soon enough Morgan Earp interrupts them and picks a fight. He knocks Chekov down and when Chekov gets back up, Morgan shoots him in the gut, killing him. Kirk is confused by this. Chekov was playing the part of William Claiborne and he was the only one of the Clanton clan who survived the shootout. (Well, Ike survived, too, but we'll just go with it for now.) While Kirk muses, Bones and Spock finish the tranquilizer and call for a volunteer to test it. Scotty steps up, takes a shot of whiskey, and opens the canister of tranq gas in front of himself. The smoke billows into his face, but nothing happens. 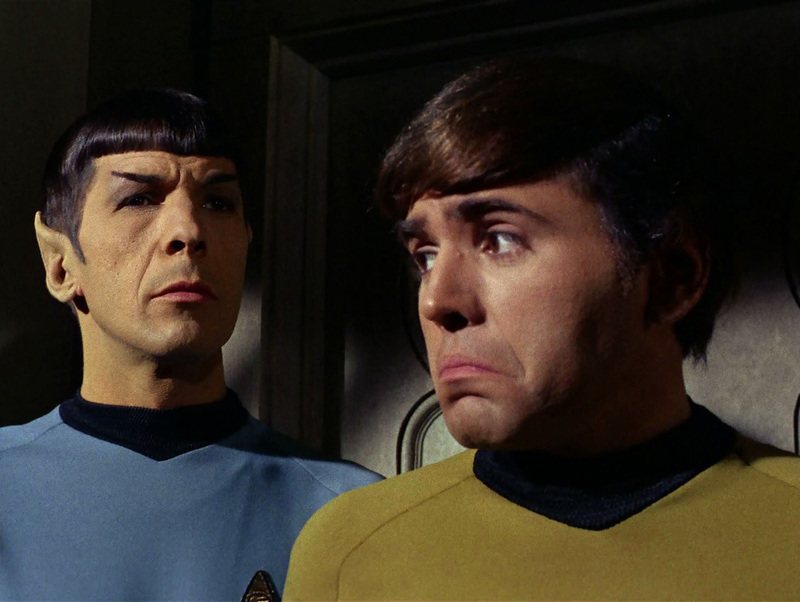 Nothing happens where, according to Bones and Spock, it, by all rights, should have happened. They are, therefore, convinced that none of this is real. Because the floating clock wasn't enough of a give-away. It's almost time for the showdown. Recognizing this, Kirk vows not to leave the bar. But then their alien captors are like "LOLNOPE!" and teleport them all to the O.K. Corral. The Corral itself is now surrounded by a forcefield, so that there is no escape. Spock then explains to the rest of the party that since nothing here is real, nothing here can hurt them. Only what you believe will harm you will end up harming you. Therefore, if you believe the bullets are nothing, they will not hit you. Bones responds that they're not Vulcan, they can't just switch off their fear. So Kirk turns to Spock and says "...hey, can you switch off our fear?" Spock performs mind melds on everyone so that when the Earps arrive, the "Clantons" face them with renewed confidence. The Earps fire and the bullets pass right through the landing party. They tear up the fence, but no more. When they're out of bullets, Kirk attacks Wyatt Earp and is about to kill him, but stops when he sees the terror in Wyatt's eyes. That's when they find themselves back on the Enterprise. The Melkotians were impressed that Kirk didn't kill. They, therefore, extend the invitation for the Federation to establish relations. Chekov is alive and well and they all live happily ever after and learn a valuable lesson about American history. I love a good western. And by "good" I mean one that incorporates sci-fi elements. Back to the Future part III, Wild, Wild West, and this episode. (Don't judge me on the Wild Wild West thing.) This classic episode has a few screw ups, but it's overall pretty entertaining. And I'm glad that Chekov is taking a bigger role this season!